Antimicrobial coating inhibits growth of odor-causing bacteria, mold, and mildew on the Filtration. Finally reach under your furniture and see things you normally could not. A 30 ft. cord provides a large cleaning radius. Bring your ELEVATE COMMAND™ into an Authorized Service Center every year for a comprehensive 9-point inspection & maintenance check-up to ensure your vacuum runs at optimal performance for years to come. Oreck® ELEVATE COMMAND™ vacuums are made in the USA of US & globally sourced components. Thank you for supporting US jobs with your purchase. Why does Elevate™ not have tools on board? On average, people only use tools on their vacuum about 1-2 times a month. Additional tools can add over 5lbs of weight to a vacuum, which is substantial when doing routine floor cleanings & going up & down stairs. At Oreck®, we are focused on giving you the most effective clean, with products that are easy to use and exceptionally lightweight. As a result, we offer a separate, specialized handheld device; allowing you to customize your cleaning needs based on the task required. Purchasing both the Elevate vacuum and Ultimate Handheld together ensures all your cleaning needs are covered. 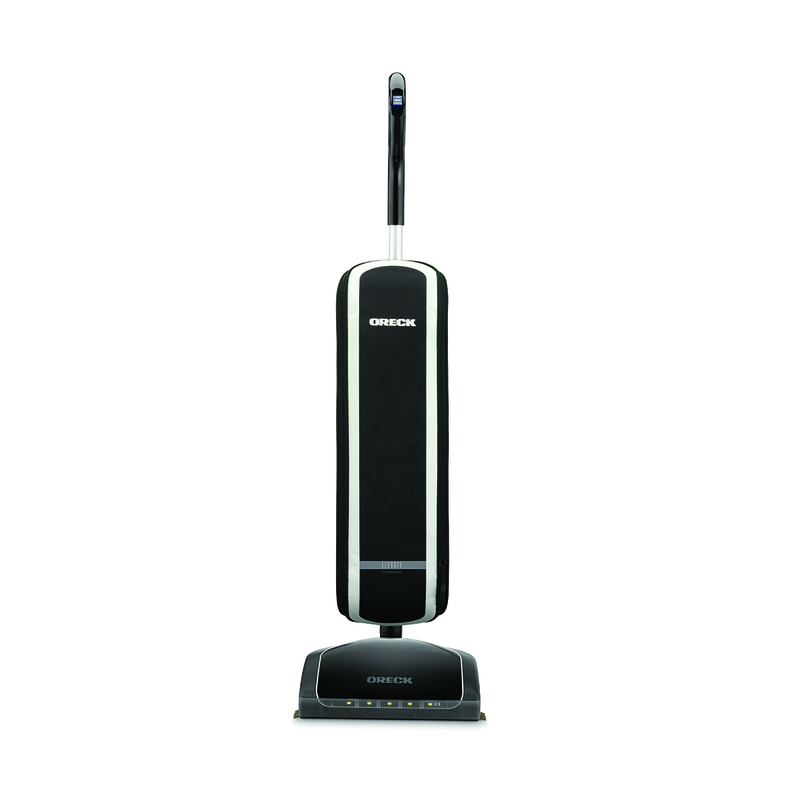 Oreck’s Elevate vacuums weigh less than 10lbs and the Ultimate Handheld weighs less than 5lbs. Why do Elevate vacuums use filtration bags instead of dirt cups? We believe in helping you create a clean and healthy home, by providing products with proven filtration methods. Unlike traditional bagless vacuums with dirt cups, the Elevate offers an entirely fresh filter each time you change the filtration bag. You simply snap in a new filtration bag and you are ready to clean! No more time wasted on cleaning and drying your filters or those dirty puffs of dust each time you empty your vacuum. In addition, the Oreck SaniSeal® System automatically closes each filtration bag upon disposal, helping to seal in dirt, debris and any allergens from your clean. How often do I have to replace the filtration bags? Oreck has extra-large filtration bags, which hold up to 4x the capacity of a typical bagless dirt cup. The time between filtration bag changes depends on the volume of debris you are cleaning (pet hair, cereal, etc.). On average, most people change their upright vacuum filtration bag approximately every 3 months. What is a Service Tune-up? A service tune-up entails a 9-point inspection and thorough clean to give your vacuum a fresh start. Tune-ups are not mandatory, but are recommended to ensure your vacuum is always working at its optimum. Your Elevate vacuum will come with a set number of tune-ups depending on the model you purchase and can be performed by our expert team of trained technicians, at our local Oreck stores (located nationwide). If you can’t find an Oreck store or Authorized Service Center, you can simply call Oreck Customer Service for details on how to send your machine to our manufacturing plant for a service tune-up. *** With purchase on Oreck.com, additional warranty and service coverage is available FREE of charge with printable certificate.